Capital market performance of the global top 100 banks recovered in Q1 2019 but lagging behind most other industry sectors –market cap improved by +8.7% qoq and the TSR by +8.2% qoq. European banks were not able to keep up with the performance of banks in other regions –TSR of +5.7% qoq, P/B ratio remains on a depressing value of 0.68x. The negative trend of Western Europe’s GDP growth is expected to continue (-0.04pp) but also in the U.S. and BRICS countries the expected GDP growth lost momentum (U.S.: -0.20pp, BRICS: -0.32pp). Monetary policy decisions were adjusted accordingly and Fed as well as the ECB postponed interest rate hikes planned for 2019. Based on full year figures, banks across all regions were able to improve their average RoE in 2018 – U.S. banks: +4.8pp yoy, Western European banks: +1.0pp yoy and BRICS banks: +0.7pp yoy. Consolidation is a huge topic in European banking, currently fueled by the start of merger negotiations between Deutsche Bank and Commerzbank. Levels clearly differ across European countries – e.g., still high fragmentation in Germany, whereas Swedish market already more concentrated. No panacea – several obstacles and success factors need to be considered when talking about mergers on national as well as pan-European level. 3rd act of LCR – “fine-tuning” or LCR 3.0? Global stock markets have performed remarkably well in the first quarter of 2019 (MSCI World market capitalization +13.5% qoq, total shareholder return +12.6% qoq). 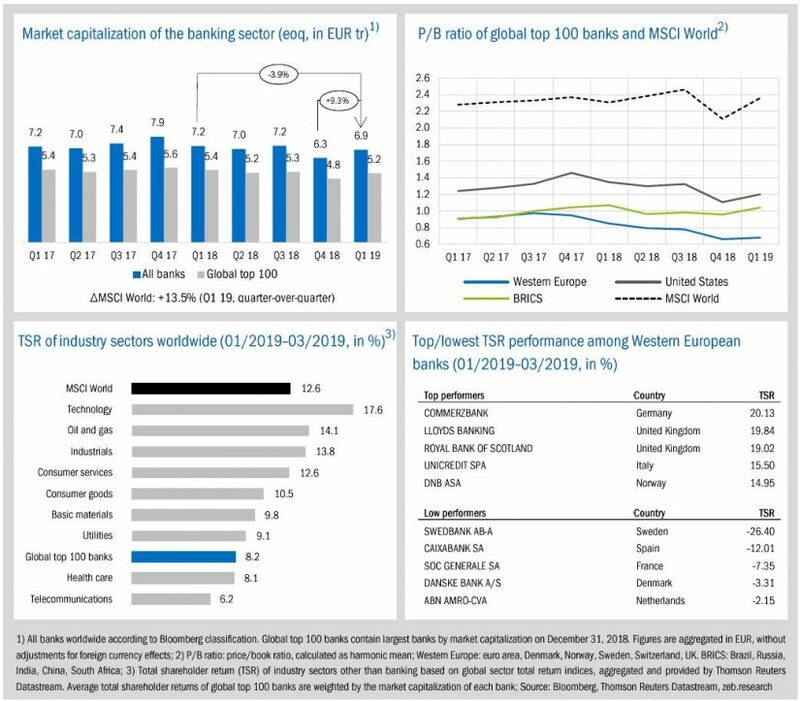 The global banking industry offset major parts of its large losses in market capitalization during Q4 2018 and all banks’ market cap increased in the first three months of 2019 by +9.3% to EUR 6.9 tr (-3.9% yoy). Capital market performance of global top 100 banks also recovered but lagging behind most other industry sectors. The global top 100 banks showed an improving market cap of +8.7% qoq (-4.1% yoy) and a TSR of +8.2% qoq. Average P/B ratios of the banking industry improved in Q1 2019. U.S. banks’ average P/B ratio rose by +0.10x and BRICS banks’ P/B ratio by +0.08x, slightly above the important hurdle of 1.0x. European banks marginally interrupted the negative trend in the P/B ratio (+0.02x qoq) but still remain on a depressing value of 0.68x. Western European banks were not able to keep up with the TSR performance of banks in other regions. While U.S. and BRICS banks showed a TSR above +9.0% qoq (U.S.: +9.4%, BRICS: +9.8%), Western European banks performed on average with a TSR of just +5.7% qoq. Among Western European banks, however, some banks showed a strong TSR performance. Supported by merger negotiations with Deutsche Bank, Commerzbank is the European top performer with a TSR of +20.1% qoq. Swedbank was the European TSR low performer, affected by the money-laundering scandal of February 2019. Over the first quarter of 2019, the economic environment deteriorated across all major regions. 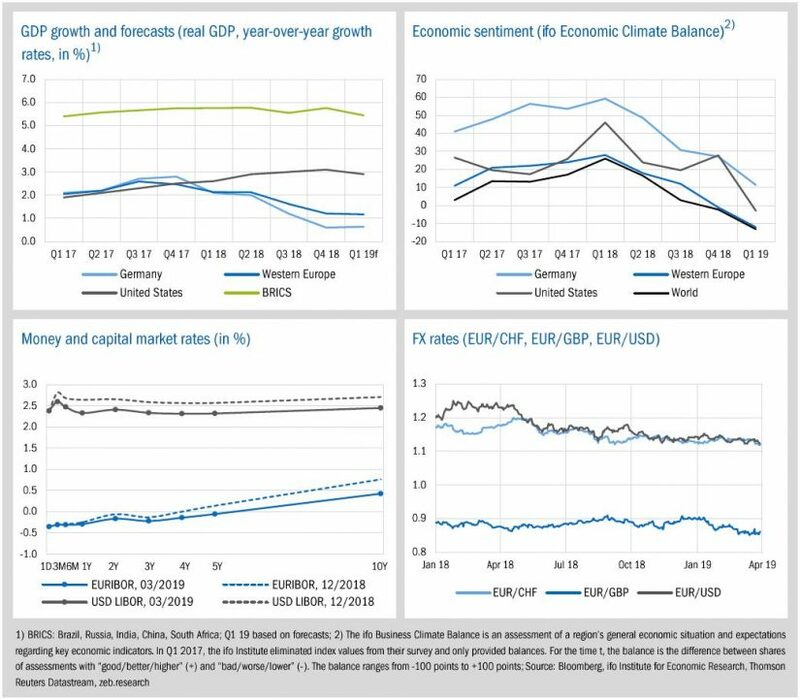 The negative trend of Western Europe’s GDP growth is expected to continue (-0.04pp to 1.17%) but also in the U.S. and BRICS countries the expected GDP growth lost momentum (U.S. -0.20pp, BRICS: -0.32pp). Monetary policy decisions were adjusted accordingly and both the Fed and the ECB postponed interest rate hikes planned for 2019. For Germany, however, economic growth is expected to increase slightly in Q1 2019 by +0.04pp to 0.64%. After five quarters of decreasing values, a positive development of the labor market and rising private consumption are expected to provide growth impetus. The ifo Economic climate index decreased for all considered regions to the lowest values for more than four years. U.S. economic sentiment deteriorated considerably and plummeted by -30.7 balance points to -2.9. For the U.S., Western Europe as well as worldwide, the overall assessment of the current economic situation is now negative. The Fed stepped back from their previous announcements of two rate hikes in 2019 and indicated no further operations this year. The USD Libor curve has remained partially inverted and shifted downwards. Similarly, the ECB communicated no raise in interest rates before 2020. As a result, the EURIBOR curve flattened. During the first quarter of 2019, the GBP weakened against the euro due to a tightening Brexit deadlock. EUR/GPB dropped down to 0.86, the lowest value since May 2017. Based on full year figures, profitability of global top 100 banks remained relatively stable over the second half of 2018. Compared to previous’ year figures, banks across all regions were able to increase their average RoE for 2018 (U.S. banks: +4.8pp yoy, Western Europe banks: +1.0pp yoy, BRICS banks: +0.7pp yoy). Especially U.S. banks did well and finally benefited from lower tax rates, increasing yields and a boom in the retail-banking market. U.S. banks ended 2018 with an average RoE of 12.7% whereby the four biggest U.S. banks (JP Morgan, Bank of America, Wells Fargo, and Citigroup) reported record profits of in total USD 101.6 bn. European banks were only able to slightly increase the average profitability to 7.9%, mainly driven by good results of some Swiss and UK banks. 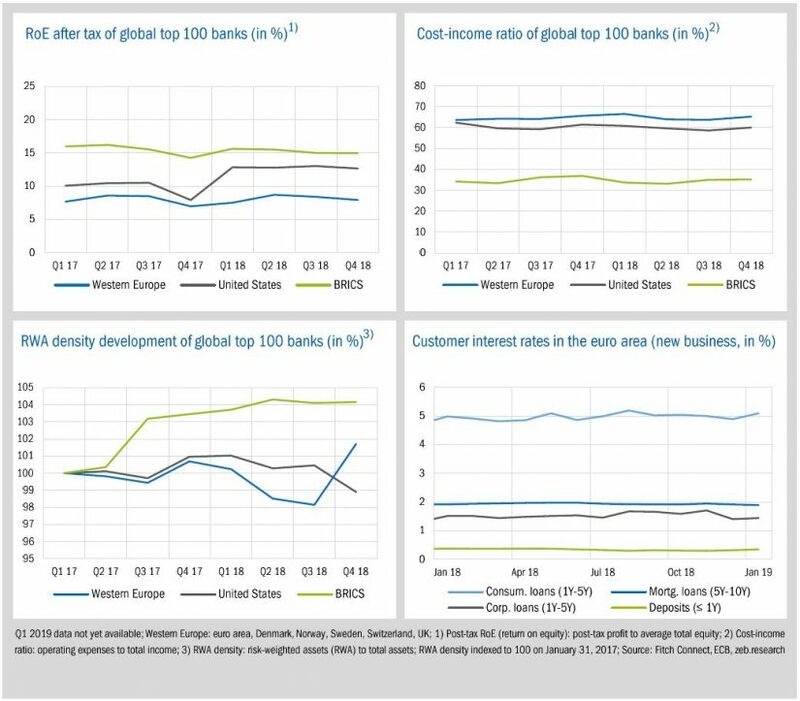 Average CIRs of global top 100 banks slightly increased across all regions in Q4 2018. On a year-over-year basis, minor efficiency gains are observable (CIR Western Europe: -0.4pp, U.S.: -1.4pp, BRICS: -1.7pp). In the final quarter of 2018, the risk density of European banks jumped up by 3.6pp to 101.7%, significantly influenced by higher RWAs for Swedish banks (+28% yoy on average) where the Swedish regulator raised the mortgages risk weight floor with effect from December 31, 2018. After recent positive developments, corporate loan rates in the euro area declined at the beginning of 2019 (-0.15pp compared to October 2018), whereas deposit and consumer rates showed slight upward movements (deposits +0.04pp, consumer +0.05pp). Consolidation is still a huge topic in European banking, currently both fueled by the start to merger negotiations between Deutsche Bank and Commerzbank as well as upcoming rumors of interest from UniCredit. The creation of such bank champions is seen by many politicians and regulators as a long expected step to a further, necessary consolidation in Europe. 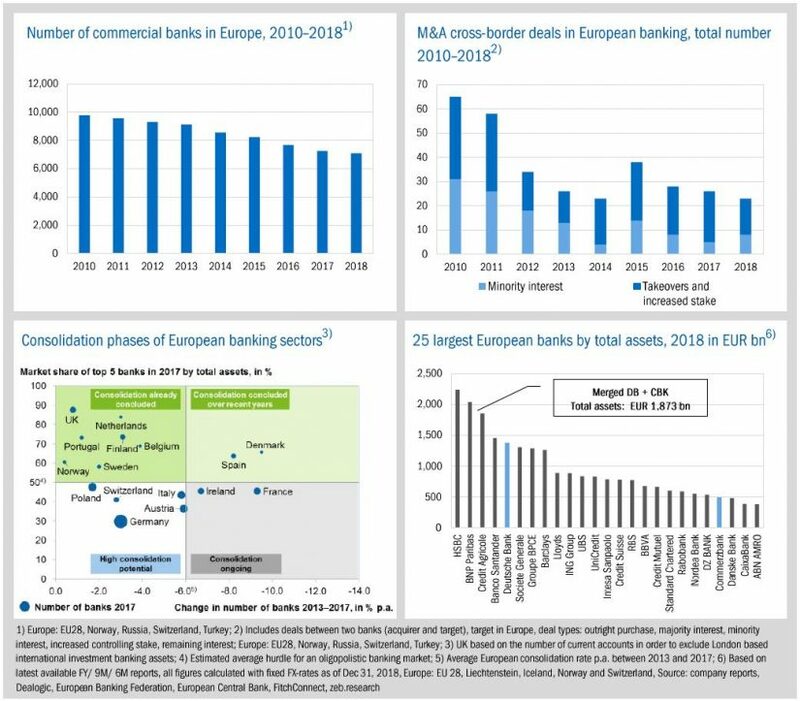 However, what is actually the current status of consolidation in Europe and what are the obstacles and success factors for upcoming European bank mergers? Increasing consolidation has already influenced the development of the banking landscape in Europe in recent years. Between 2010 and 2018 the amount of European Banks reduced from 9,771 to 7,093 (-27%) – a drop of nearly 2,700. More than half of this reduction is generated by just five countries: Germany (-11.6% decrease of commercial banks 2018-2010), France (-10.6%), Austria (-8.7%), Netherlands (-8.5%) and Italy (-8.2%). Most of these mergers took place on a domestic level and within banking sectors. The amount of cross-border mergers and acquisitions has decreased over the last few years – there were just 23 such M&A deals in 2018, -65% compared to 2010. Furthermore, a closer look reveals that these deals are composed rather of acquisitions of separate business lines than outright mergers. Within this overall trend towards consolidation, there are clear differences observable between European countries. Comparing the market share of the top five banks with the change in the number of banks in each country, European banking markets can be clustered into different consolidation phases. In markets like Sweden, for example, a massive consolidation of banks already took place following the Swedish banking crisis in the mid-1990s, with around 90 percent of banks having merged to form just a few large institutions. With a market structure like this, cross-border activities demonstrate one major way for further growth. In contrast, several large European markets, such as Germany, Austria and Switzerland, show still high national consolidation potential, partly due to clearly separated banking sectors (savings/cooperative banks, private banks, etc.). There is always an argument that growth via mergers and acquisitions can lead to greater economies of scale and, thus, higher profitability. Pursuing M&A can therefore be a valid option to manage the persistent strategic pressure for European banks to find a solution to increase profitability and capital market performance. Consequently, the practicability of mergers, especially on a pan-European level, becomes the predominant question for several of Europe’s largest banks. Whereas cross-border mergers are clearly possible from a pure regulatory point of view – and also recently welcomed by the ECB – they are fraught with hidden costs and asymmetries. Failed attempts of cross-border mergers in the past have shown that, even after many years, problems remain with regard to integration, the result of persistent cultural differences or legal systems. Different European countries still show different legal environments, tax systems, banking products, languages, practices and IT legacy systems. These obstacles can easily derail a merger and drive up the cost of integration or hamper the reaping of synergies. For countries with a high consolidation potential – like Germany – the focus of banks for suitable targets or partners is more on a national level. Taking into account the large stake of the German government in Commerzbank, it is not surprising that in the current environment Deutsche Bank and Commerzbank have started merger talks. This deal would result in the third-largest bank in Europe (by total assets)– closely behind HSBC and BNP Paribas – and its market share would increase domestically to become the third-largest player on the German market for private customers. Moreover, by adding Commerzbank’s private and medium-sized corporate client business to Deutsche Bank’s segments, the merged bank may be more stable and competitive in its business model. Commerzbank’s liabilities side with higher customer deposits could also be beneficial, leading to lower refinancing costs. However, new capital would be required for the group transformation and additional growth. The realization of cost synergies would also need considerable effort as well as assertiveness. To conclude, there is a significant execution risk and the past has shown that mergers to create a national bank champion did not lead to a success story. For example, Deutsche Bank is still dealing with the integration of Postbank and expected levers are not yet realized. The takeover of Dresdner Bank by Commerzbank in 2008 was first celebrated as a huge success in consolidation of the German banking market but finally has not had the desired effects. On the other hand, there are also banks with a long standing consolidation history who overcame the obstacles associated with M&A deals, such as JP Morgan Chase & Co. or Nordea Bank. The crucial factors for such successful post-merger integrations are the culture and integration power of the banks, their complementing business models as well as their IT and organizational models. Positive examples show a clear definition of the guiding culture underpinned by the top management and a strong internal M&A team. A sustainable and profitable business model for the aspired new credit institution is required, as well as a rapid alignment of the customer base and the common target model, including transparent and customer-centric communication. The involved banks should quickly transfer the existing product structure to the target set and shutdown the legacy offer accompanied by migration incentives for customers. Overall, a successful merger requires a migration and (full) harmonization of the IT systems and a consistent shut down of all legacy systems. Consolidation in Europe is still a work in progress. In order to strengthen the financial system, politicians and European regulators have been more and more supportive of M&A for low capitalized and rather unprofitable institutions. Unfortunately, consolidation on a national and pan-European level is no panacea and several obstacles and important success factors need to be considered. Further European legal harmonization, finalization of the banking union and the development of an overarching European policy for the banking sector will ultimately favor cross-border mergers. However, whether we see a growing number of succesful large bank mergers in Europe will also depend on bank’s management capability, its skills and strengths in order to execute successful post-merger integration processes.